From the time that your little one can stand and walk on her own, she’s ready to become mommy or daddy’s kitchen helper. Exactly what she can do depends on her temperament, your patience, and the level of her dexterity. Fortunately, you can tailor these tasks for her so that they are easier to accomplish, while also staging them so that less mess is created. Parents should never underestimate the true value of teaching their children to cook because so many benefits exist that it is difficult to figure out why anyone would want to miss out on such an enjoyable opportunity to bond with their child, encourage healthy eating, develop language and vocabulary skills, and enhance nutritional knowledge. Children love to spend time exploring new things. The experience is even better when they can do so with mom or dad. Plenty of time exists to interact with your child while teaching her to cook, so enjoy every moment. Make sure to take a photo or two to share later on in life. If you want your child to grow up learning the importance of healthy eating, you must take the time to encourage this habit. What better time is there to do so than those occasions when your child helps you to prepare a meal? Depending on your child’s age, you might be able to expand her vocabulary as you teach her the names of different kitchen tools, such as strainer, spoon, tongs, and measuring cups. Of course, you can also teach her the names of different ingredients that she might not be familiar with like flour, cinnamon, olive oil, and so on. If you really want to have some fun, why not teach your child how to say these words in two different languages? You’ll both have a chance to learn something fun! 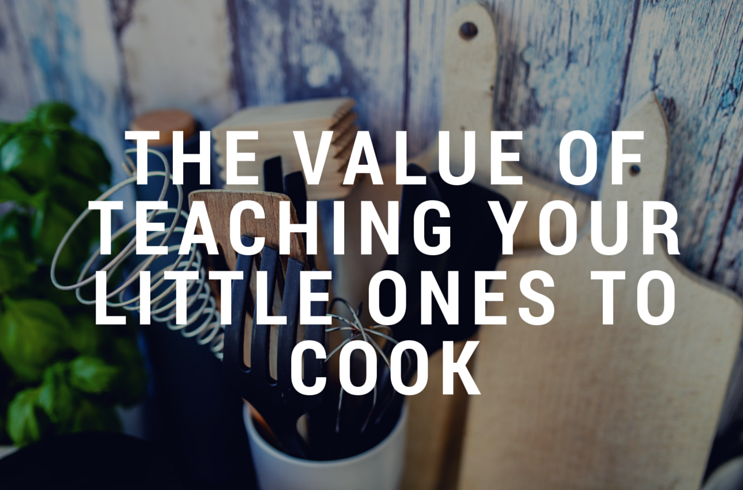 Teaching your child to cook gives you a valuable opportunity to teach them about nutrition. Sometimes, it helps to study up on it a little before you begin. For example, you can have your child help you wash fresh veggies as you prepare them for dinner. As the two of you complete this task, talk about the kind of vitamins each vegetable contains and mention the benefits of eating them, even if it is only to explain that veggies are full of nutrition. You can also involve your child in planning the family’s weekly meals and ask for their help in making sure that each meal is nutritionally balanced. Following a few tips can help to minimize the risk of accidental injuries for both you and your little one. Here’s a list of things to do before you begin your cooking session.
. Put sharp items like knives out of reach.
. Set up your working area away from the stove or oven.
. Make sure that any stools or chairs that your little one is going to use are safe.
. Use non-breakable dishes, cookware, and measuring cups for small children.
. Use plastic whenever possible because it is lighter and easier to handle. For example, a plastic rolling pin won’t hurt so much if it is accidentally dropped on someone’s foot.